Signing at ALA in San Francisco! Friends! On Saturday I'll be attending the ALA (American Library Association) conference for my very first signing event for the JP books! Series author Ana Crespo and I will be at the Albert Whitman booth (#1204) from 1:00 to 2:00pm. Because the JP books don't come out until fall, we'll be signing broadsheets featuring interior art from book one (sort of like little posters) instead. If you'll be there, pop by, say hello, and get some swag! Also--JP artwork is featured on the cover and first two pages of Albert Whitman's Fall catalog! Everything is awesome. 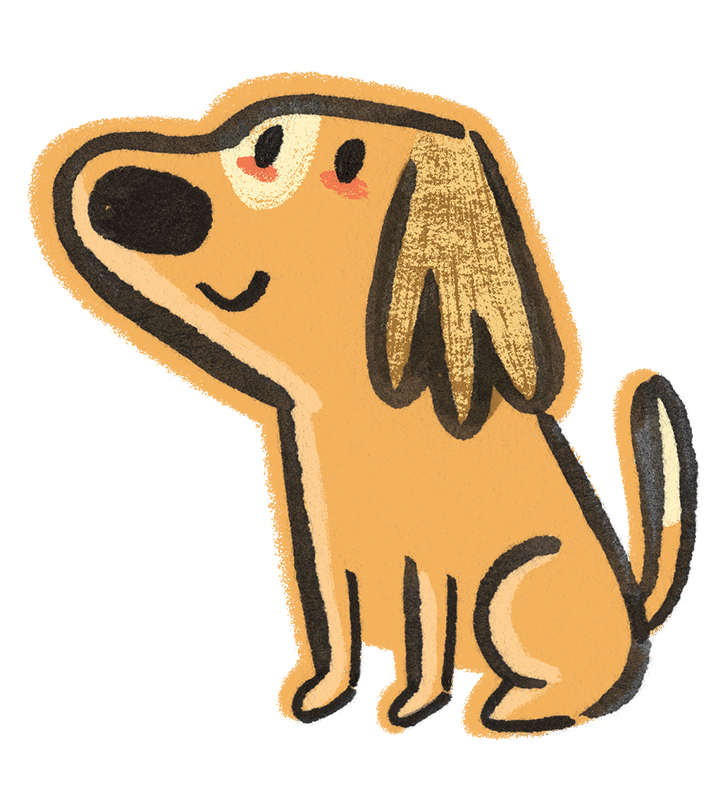 Over the last few months I've been a busy bee, working away on a series of picture books for Albert Whitman & Company. Say hello to JP and his sidekick pup! The first two books in the series, which explore emotions like fear, anger and jealousy in a quirky, creative way, are due to hit shelves in Fall, 2015. I've had a blast developing the books' characters and am really excited to finally share these two with you! I've been unusually quiet lately; this is why! Hopefully I'll have more to share super soon! I thought it'd be neat to periodically share a piece's process from its earliest stages to its completion. I recently finished "Hard Hat Area"; my goal for this project was to visually explore a topic that's appealing to children, but that I've had little experience drawing--vehicles & construction equipment. For whatever reason I didn't expect this task to be fun, but I was wrong; I had a blast working with the more boxy shapes and mechanical details this piece required. I also realized that the best way to approach the vehicles would be to treat them as characters too, giving them as much as personality as possible. The thumbnails for "Hard Hat Area" were oriented vertically in the beginning. The first one was problematic because it would have rapidly resulted in a head on dump truck-bulldozer collision. The second is much closer to the layout of the final piece. First rough sketch of the dump truck. At this stage the driver was some sort of lizard and he looked bored, probably from driving all day. First rough sketch of the bulldozer. This version is a lot longer than what appears in both the thumbnail and the final piece. I actually really love this dozer design; for the final, I modified it for compositional reasons, making it more compact. But the next time I draw a bulldozer it'll be more like this one, for sure. Sketch of a vehicle that wasn't included in the final piece. Ink drawing of the dump truck. After refining the sketch of this vehicle I dropped it on a light pad and inked it on a fresh sheet using brush pens & Microns. I prefer this truck's driver much more than the lizard. He's a real no nonsense guy. Ink drawing of the bulldozer. This is a much more compact design than in the sketch. It's tighter, a bit more stylized, and fits the space better than the prior design would have. I also think it has a "younger" look than the dozer in the sketch above, which is appropriate, because I envision this to be an image for a very young audience. Final colored dump truck. I used some new textures and brushes on this, opting for a soft billow of stinky exhaust spewing from both vehicles, rather than the bubbly clouds that appear in the thumbnails. I overlaid a texture to give the entire piece a bit of a grittier, rougher feel. I also used a custom Photoshop brush to depict the dust and dirt flying everywhere. But that didn't stop that bear from indulging in an entire slice of Brie cheese right in the middle of the work site. I drew, inked & colored the background elements & secondary characters separately from the vehicles; this helped me play with the piece's composition digitally (it was actually at this later stage in the process that I decided to orient the piece horizontally). I like the versatility of this process; it allows me to make modifications easily when required and really experiment with the piece's overall look and feel. Right around this time last year, I attended a Creative Mornings SF session that invited audience members to reflect on creative lessons learned and goals posed for the year ahead (2013). I'm not a fan of public speaking so, naturally, my fingers were crossed that I would not have to get in front of that room. Three groups of three attendees' names were randomly pulled from a hat and, surprise surprise, my name was among them. Ugh. To add to my intimidation, Lisa Congdon was sitting in the front row. Like me, Lisa is a self-taught Bay Area illustrator who realized well after college that she wanted to pursue an art career. Other than the fact that we are both obsessed with Iceland, that's probably where our similarities end. She's worked with major clients that many of us only dream of, has multiple book projects to her credit, runs a thriving Etsy shop, undertakes fine art projects and exhibits in galleries. (Here's a really cool short film about Lisa.) She's rad. Needless to say, I was nervous. My group was last to speak; we were invited to discuss our visions and hopes for the future (more specifically, for 2013). When the mic was handed to me, I started jabbering about how I intended to do a children's book in the new year. I didn't actually have a concrete plan or apparent opportunity to do a children's book, but it's been my primary illustration goal all along, so those were the words that tumbled out of my mouth. In the summer, I attended the Society of Children's Book Writers and Illustrators conference in LA. It was hugely overwhelming and inspiring. I participated in the Illustrator Intensive, Portfolio Showcase, and had a consultation with Mela Bolinao of MB Artists, the agency that represents one of my favorite children's book illustrators, Jannie Ho. (I also attended workshops put on by Jannie herself!) I came home motivated and excited but also with a sense of how massive the crowd of talent aiming to work in children's books is, how talented these people are, and how limited the opportunities seem to be. A few weeks after the conference, as I was contemplating how presumptuous it was for me to get in front of that Creative Mornings crowd and announce that I'd be doing a kid's book before year's end, I received an email from an illustration manager at Teacher Created Materials, an educational publisher. He found my work at SCBWI and asked me to create a series of board games for elementary-aged children. Fun! For me, children's toys, games, activities & novelty products are second only to children's books on my illustration project dream project list. And I love projects with an educational bent. So I spent a few weeks creating the first children's products to bear my name. Here's one of the board games, called Under the Sea, and a detail shot. 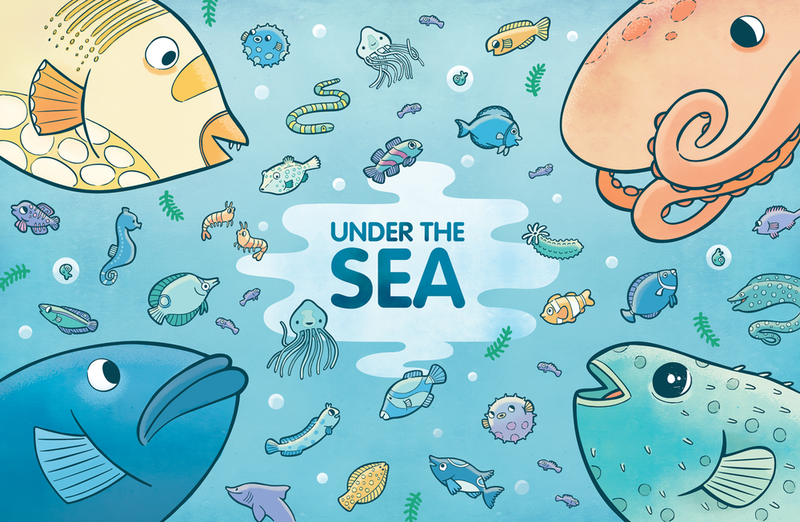 Under the Sea, a board game for Teacher Created Materials. 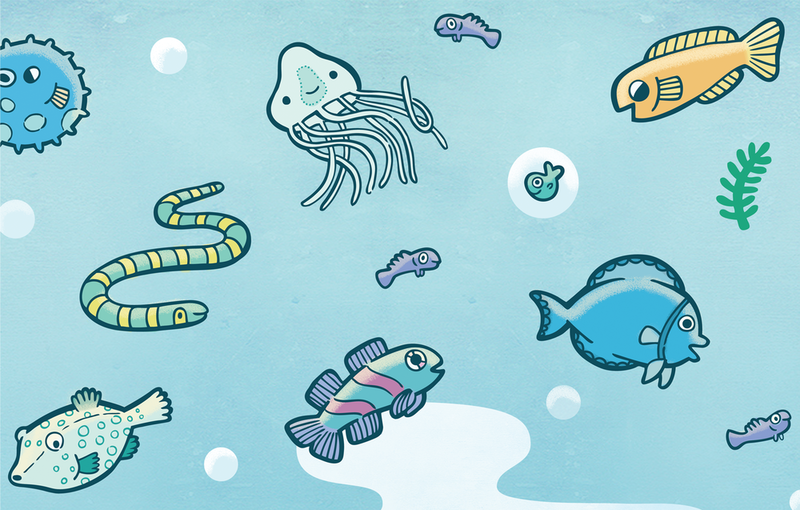 Detail from the Under the Sea board game. Doña Araña, an illustration for ¡Di Algo!, my first children's book project. I suppose my haphazard pronouncement at Creative Mornings a year ago wasn't entirely out of turn. Perhaps just putting that ambition out into the world helped initiate some momentum that led me to attend SCBWI, which led to the string of opportunities that resulted in my first little book project. I feel like I'm entering 2014 with a bit more confidence than the previous year. I've got a personal book project in the works now, perhaps to be self-published; perhaps I'll build up the gall to pitch it to publishers. As much as I enjoyed working on ¡Di Algo!, I am excited to have more creative control over my next major project, to have the opportunity to inject more quirk and character into it and to have more time to let it marinate and develop before fully realizing each and every page. Having worked as a full-time freelance illustrator for nearly four years now, I've become more and more aware of how each project paves the way for and builds upon the next. A career in illustration is a process of gradual unfolding and growth. 2013 was my first year really working in the market I've had my eye on all along, and I feel I've only scratched the surface. In 2014, I hope to work on more children's publications and novelty products. I can't wait.